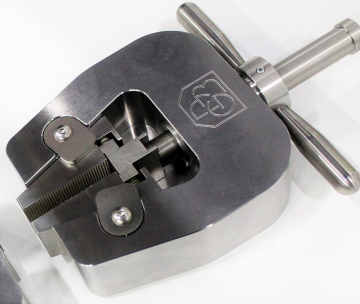 Gibitre produces a wide range of clamps for tests on standard specimens or manufactured articles. In the list below you can find frequently required grips. Many other models are available on demand. The list of grips shown on this page is not exhaustive. 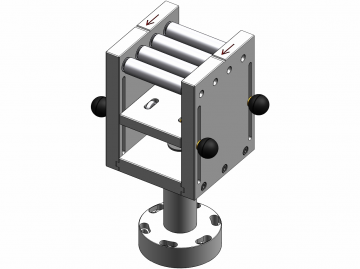 Numerous clamp models have been produced for specific applications. For specific needs about non-standard test procedures, please contact us. 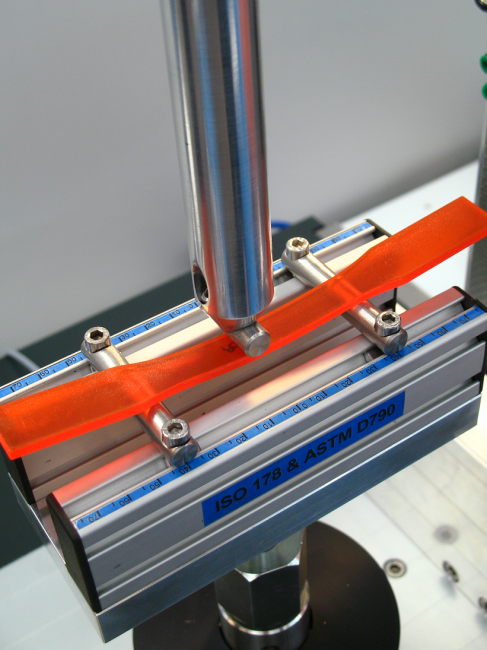 All clamps are applied to the Tensor-Check tensile tester using the standard Gibitre fastener. The clamp can be replaced in a few seconds by inserting the clamp shank into the housing seat and closing the fixing handwheel. The fastening device blocks the clamp avoiding play or movement both when a force is applied in tension or in compression. This feature makes the device optimal even for complex test cycles requiring the alternating application of tensile and compression forces. The pneumatic clamps produced by Gibitre allow to adjust the closing pressure to adapt it to the type of product to be tested. The two pressure gauges on the front panel of the instrument allow checking the applied pressure. 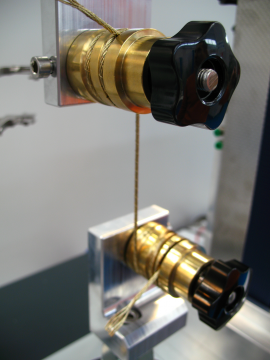 The connection of the clamp to the compressed air is carried out in a few seconds using the quick connectors. 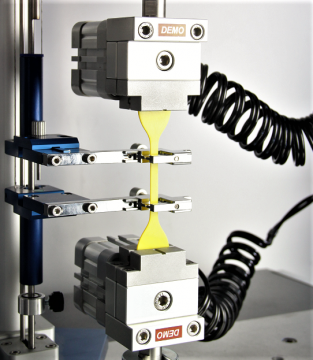 Opening the clamp when the specimen is broken can be done automatically to speed up the preparation of the next test. Couple of pneumatically actuated vice grip with tightening closure regulation and maximum closure force 2000 N.
Several types of Jaws are available. Application: General purpose grips for tensile testing of rubber, plastics, textiles and other materials where self-tightening is required. Note: Those grips are not suitable for Environmental Chamber. Couple of pneumatically actuated vice grip with tightening closure regulation and maximum closure force 600 N. The grips are provided with standard jaws. A range of optional cross cut, plain and rubber jaw faces are available. Those grips are not suitable for Environmental Chamber. Couple of Bollard grip with pneumatic camp for metal wire, yarns and threads. The sample is wrapped around the bollard and the free end clamped firmly using a pneumatic clamp. Grip stresses in the specimen are distributed in the material in contact with the bollard circumference. Couple of general purpose manually operated self-tightening sliding wedge grips. The grips are provided with serrated jaw faces. 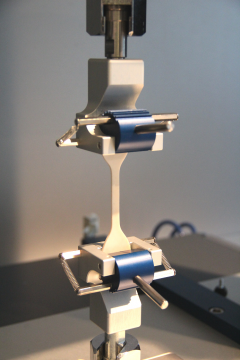 Application: tensile testing of plastics and composite materials where self-teghtening is required. Couple of self-tightening bollard grips. The sample is mounted over the bollard and positioned between the bollard and the grip shank. The fine serrated finishing of the parts in contact with the sample helps to prevent slippage. Application: tensile testing of textile, rubber pipes, etc. Couple of manual operated vice action grips. Jaws with different finishing are available under request. 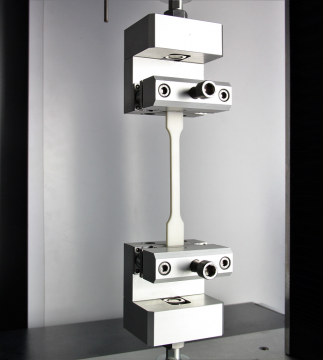 Application: tensile test of rubber, leather, textiles. General purpose self-tightening grips ideal for dumbbell and flat specimens. The roller operates using a basic cam jamming principle. The rollers have a fine serrated finish that helps to prevent slipping. 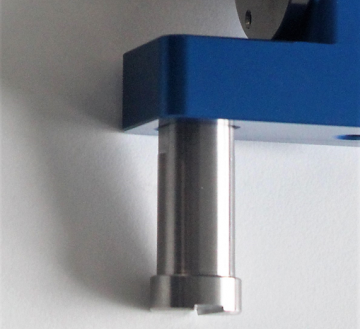 Maximum sample width: 30 mm. Maximum sample thickness: 5 mm (0.2 in). 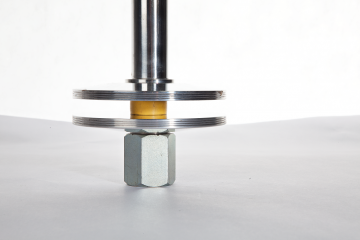 Applications: Ideal for tensile testing sheet materials including polymers and rubber. 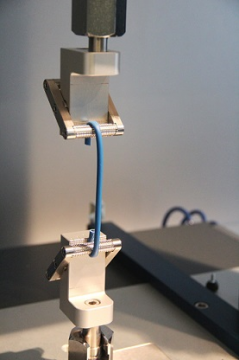 Additional use: the grips are suitable for the execution of tensile tests with environmental chamber. 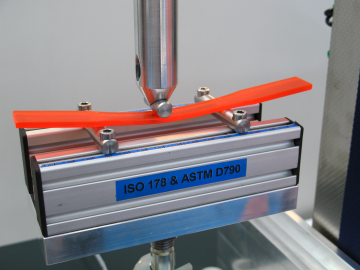 Couple of supports for tensile test of O-Rings conforming to ASTM D 1414 standard. The support can be used in combination with Gibitre TensorCheck instrument. 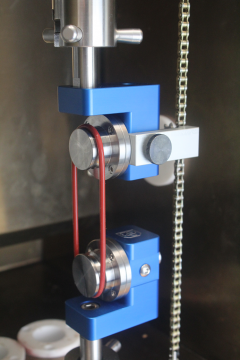 According to the standard, the device permits to elongate and rotate the O-Ring in the pulleys at the same time. The Pulleys are interchangeable. The dimensions need to be selected in accordance with the dimension of the o-ring to be tested. Pulleys with different dimension can be produced for specific needs. Grips suitable for environmental chamber. The lower platen is fitted with ball joint to ensure parallelism between the planes during the test. The upper platen is fitted with articulated joint to ensure parallelism between the planes during the test. 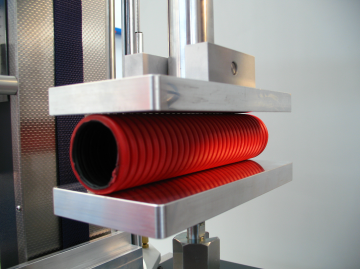 Application: compression Tests on corrugated pipes according to EN 50086-2-4. Compression tests on foam and expanded products. The sample is wrapped around the bollard and the free end is clamped firmly using a screw operated vice. The grips are ideal for the tensile testing of wires, small pipes or cable sheath. The lower grip permits to set the distance between the contact points. - a low friction pulley . 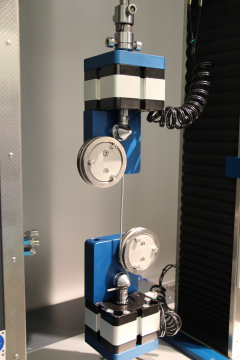 The test is performed by fixing the sample to the sled, placing the sled on the glass plane and activating the displacement of the crosshead of the tensile tester. 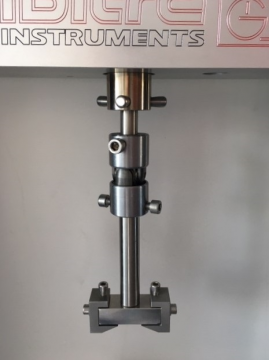 The test procedure integrated in the software of the tensile tester permits to display the resistance force of the sample and to calculate the static and dynamic friction coefficients. The grip permits to fix the metal plate. A ball joint ensures the perpendicularity between the metal plate and the free end of the rubber strip during the test. Note: a standard grip is required for clamping the free end of the rubber strip. The rigid specimen moves under the rollers and the layer to be separated is passed between the rollers and pulled by the top clamp. 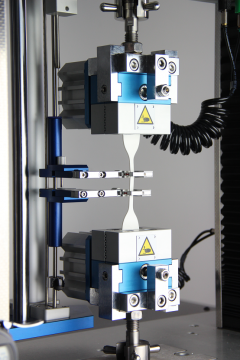 Application: The terminal is ideal for peeling testing on multi-layer materials and rigid samples. 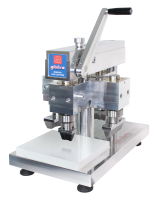 Gibitre produces a wide range of clamps for tests on standard specimens or manufactured articles. Couple of circular platens for compression tests with 120 mm diameter. Couple of rectangular platens for compression tests with dimensions 220x100 mm. The device, to be applied to Gibitre Tensile Tester, permits to perform friction tests according to ASTM D 1894, ISO 8295, ATE N 553 59 25 and similar standards. Grip for determination of adhesion to a rigid substrate (90° peel method) complying with following standards: ISO 813 and ASTM 429 - Method B. Rolling support for peeling test on rigid materials.